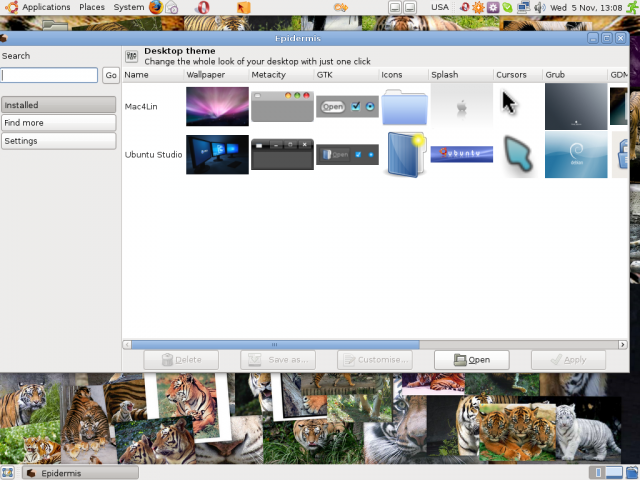 Epidermis combines wallpaper, GTK, metacity, icon, splash, usplash, cursor, grub and Xsplash themes in one GUI program for the GNOME desktop. Epidermis manages ‘packages' called pigments and downloads them from a ‘repository'. Pigments can be any type of installable customisation: current pigment types include wallpaper, icon set, GTK theme, metacity theme, gnome splash, usplash, mouse cursors, grub theme, GDM theme and finally ‘skin' which links to one pigment of every type. This allows several skins to share components, similar to how programs share dependancies, hence copying the repository functionality.